The elder daughter of M. Masud, a lawyer by profession and women’s rights activist, social worker, consultant and businesswoman. 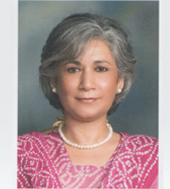 Over the past 30 years, she has been actively associated with government and semi government organizations. (Evacuee Trust Property Board, Halla Milk Idara-e-Kissan, Govt. Of Punjab Task Force, Govt. of Punjab Special Task Force for Women) and various NGO’s (Pakistan Girl Guides Association, Business and Professional Women Organization, Lahore Gymkhana Club, International Women’s Club, AMEN Society, Nirali Kitaban Trust, English Speaking Union, Women Action Forum, and Pakistan Women Lawyers Association and Asian Study Group, Lahore). She has traveled extensively around the world in connection with work and pleasure. Born in 1929, in Gujranwalla to Naima and Dr. Muhammad Nazim. Iffat had an older and a younger sister. Iffat by nature was a soft spoken gentle person very fond of the arts and music and the finer aspects of our cultural life. She was a lady ahead of her time. Besides the regular subject, Iffat also studied French and music at Kinnaird College Lahore and after graduation, she accompanied her father to UK where she joined ‘journalism’ classes. Dr. Nazim was an archeologist by profession and obtained his Ph.D from Cambridge University, UK. His thesis work on Mahmud of Ghazna was published by the Cambridge University Press in 1931 and gained world acclaim as the most comprehensive work so far. Iffat married Muhammad Masud, a young ICS officer in 1949 and throughout their married life supported and wrote about his struggle for causes close to his heart. She stood by her husband in his times of tribulations and encouraged him to continue with what he believed. 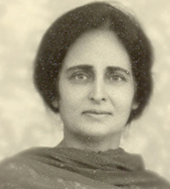 She was the founding Chairperson of the Trust till her death in 1993.